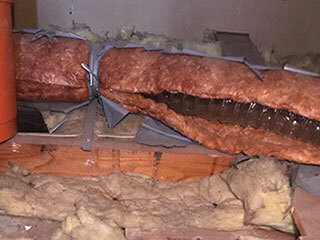 Home Some Of Our Services Attic Insulation Why shouldn't You Neglect Worn-Out Insulation? Why shouldn’t You Neglect Worn-Out Insulation? The insulation at your house has a very important job protecting the structural integrity of your property and protecting its residents. When the attic and crawl space are exposed due to worn-out materials, it means your home is now at risk of accumulating wetness, mold and bacteria. The main purpose of this protection is to be the barrier between the outside and the inside and when it is intact, it will prevent humidity from gaining access through the attic and ceiling. But what happens when the materials that were used begin to weaken and wear out and why is it important to renew them? From the moment your attic's insulation starts weakening, it loses its effectiveness. Even if it starts with the smallest of holes, the air quality at your home will start decreasing due to more contaminants making their way into your house. Poor air quality may lead to breathing difficulties and even health issues such as asthma, especially if you have infants or older family members living with you, as their respiratory system is weaker. When dust and water start entering without control, the situation can quickly develop into mold appearing on the ceiling and walls. As mentioned above, when your attic is not sealed against air and water, it won't be long until it will be contaminated and until mold starts growing. Mold is a fungus that may result in even more serious health implications than "just" breathing difficulties and if we don't treat it and clean every trace of it, it might eventually become black mold, which might be toxic and, in any case, poses a very serious hazard to you and your family. Staying at a place that is contaminated with mold and even worse – sleeping at a contaminated house, significantly increases the chances to suffer the consequences of such fungus and bacteria. The solution is much simpler than the problem – removing all worn-out insulation and properly installing a new one will restore safety for your home and family. All you need to do is call professionals who will carefully remove the old and damaged material, thoroughly clean the whole area and perform a perfect installation. Then, it will be safer and healthier to stay at your house. Therefore, it is recommended to check your attic insulation at least once a year, to ensure it is still intact and in good working order.